At 7am on a beautiful sunny morning I set off on the newly extended round of feeding. First up and most vocal was the neighbours tups. 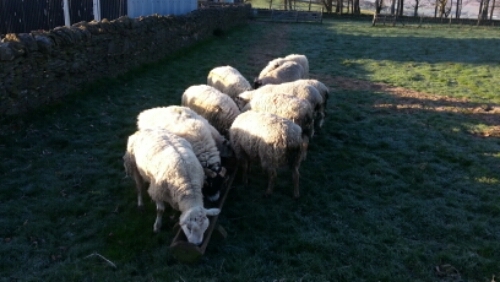 Another 9 of them arrived yesterday to make it 11 in total and all were very pleased to see me. In some cases they were a little too eager to get at the food but I managed to escape unscathed. 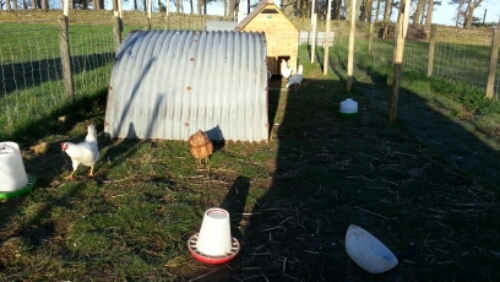 Next it was the chickens and they were less keen to emerge. Eventually a few emerged to peck at the food I’d delivered and appear in this picture – maybe the others were having a bad hair day? Finally it was the turn of the newly arrived pigs but when I got to their area in the woods there was no sign of them. 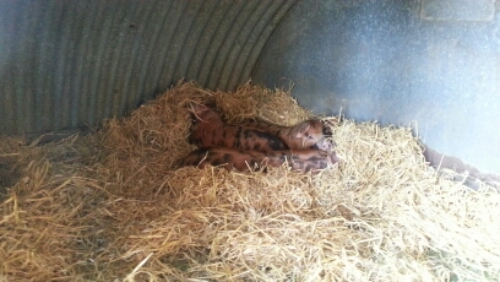 A quick check in their ark showed why – They had decided to have a lie in after the stress of moving house yesterday!